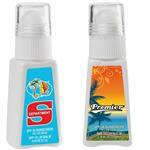 Sunscreen and Lip Balm combo with full color labels - a great golf gift or marathon giveaway. Choose this 2oz Duo Bottle with SPF 30 Sunscreen and SPF 15 Lip Balm Combo as a handy giveaway during tradeshows and conferences. Lip balm is free of Oxybenzone, PABA and Gluten. It is USA made in an FDA Registered facility. This combo is useful for any fun in the sun event! 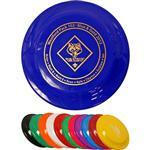 Available Colors: Free full color imprint on both items - you choose label color! Production Times Available: Standard 10-Day Production with Paper Proof. RUSH PRODUCTION AVAILABLE – INQUIRE! Typical Imprint Area(s): BOTTLE:1 3/16”W x 2 7/16”H - LIPBALM:1 1/32" x 1 41/64"
2 oz Duo Bottle with Suntan Lotion and SPF 15 Lip Balm Combo as a handy giveaway during tradeshows and conferences. This sanitizer has 63.5% alcohol. Lip balm is free of Oxybenzone, PABA and Gluten. It is USA made in an FDA Registered facility. Lip Balm Flavor: Hundreds available! Choice of flavors. Includes up to 3 flavors at no additional cost. 250 piece minimum per flavor.